Turbo Rally VIII - Quick, the Rain's Stopped Line Up the Turbos! Yes, there was a Rally, despite the three days of continuous downpours. Rick Coder and myself left for the Rally from northern New Jersey Friday, Rick aboard my Suzuki XN85 Turbo and me astride my Kawasaki GPz750 Turbo, taking back roads the entire route (Rt. 22 in New York is a delight. We picked it up just outside of Poughkeepsie. It was the only part of the trip where it stopped raining, momentarily, but it's a fun road, wet or dry. Thanks Mr. Miller). 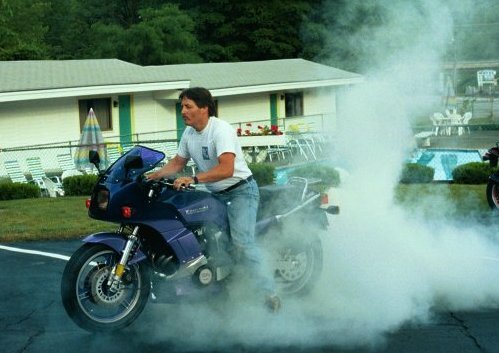 Turbo guru Mike Chestnut flew into Bowling Green, KY, rode a thousand miles in rain and hail to Philadelphia, PA, then trailered his GPz750 Turbo the remaining 400 miles courtesy of Steve Smith and his "Purple Passion" GPz750 Turbo. Eleven riders and their Turbos made the Rally along with a contingent of wives and kids. The continuous rain prevented us from making our scheduled group ride to the scenic Ausable Chasm 90 miles north of Lake George, but shortly after the photo on the previous page was taken early Saturday evening we did manage a 50-mile group ride meandering through the surrounding hillside. When sunlight breaks through in Lake George motorcycles materialize seemingly from nowhere, and disappear just as quickly when the rain inevitably resumes. During our sunlit sojourn a few members pulled wheelies out of sheer exuberance, much to the delight (or was that fright) of a standing herd of Harley riders. Some facts to ponder: There were no Yamaha Seca 650 Turbos at the Lake George Rally (an Eastern US Rally first!). Still can't explain the diminishing presence of these wonderful sport-touring bikes at our rallies. Club members with Yam Turbos, in general, have far more miles on them than other Turbo owners. Where are they all riding to?. GPz Turbo guru Mike Chestnut took a ride on my XN85 Turbo and, after cursing the mushy brakes, declared that Suzuki really choked off this bike's performance. The rainy weather gave Mike an opportunity to examine the XN's turbo hardware closely in search of hidden ponies. His conclusion? Sorry, but there's not much we XN85 owners can do to make these bikes faster. Maybe a weaker spring on the air flow meter's mechanical door would reduce turbo lag, and maybe a different muffler, maybe, would speed things up a bit. What we need is some computer wiz to design a "race chip" that allows the turbocharger to build more boost. Mike agrees that the bike is designed solidly enough to handle a lot more horsepower. The restaurants in Lake George Village were generally good although we did make the mistake of having Saturday morning breakfast at something called Friendly's Cafe. World's worst breakfast, hands-down. Friday night's dinner at S.J. Garcia's Mexican restaurant was quite good, although for some inexplicable reason the hostess couldn't figure out the intricacies of separate checks. I gathered that our cool reception was due to fallout from the Americade Rally the week before. The wait staff had the “Òoh God, not another biker gang” look from the moment we sloshed our wet boots across their ceramic-tile floor. Some establishments handle these situations well. S.J. Garcia's wasn't one of them. Saturday night's dinner at the Red Lobster was probably the best meal of the Rally. The biggest disappointment was that, due to the rain, we all jammed into whatever cars and minivans where available to make the trip to the restaurant. “Hey look, it's them Turbo guys right over there, getting out of the Safari van!” What little riding I managed to do around Lake George was memorable, even in the rain. I won't soon forget coming in on Route 9L which winds its way around the contours of the lake. Here the rain only enhanced the topography as a delicate mist clung to the surrounding hills in an almost spiritual manner. Simply breathtaking. This must be what it looks like when it rains in heaven. Mushy sentiments aside, I'd still like to see this place under clear skies. I vow to return to Lake George in dryer times. 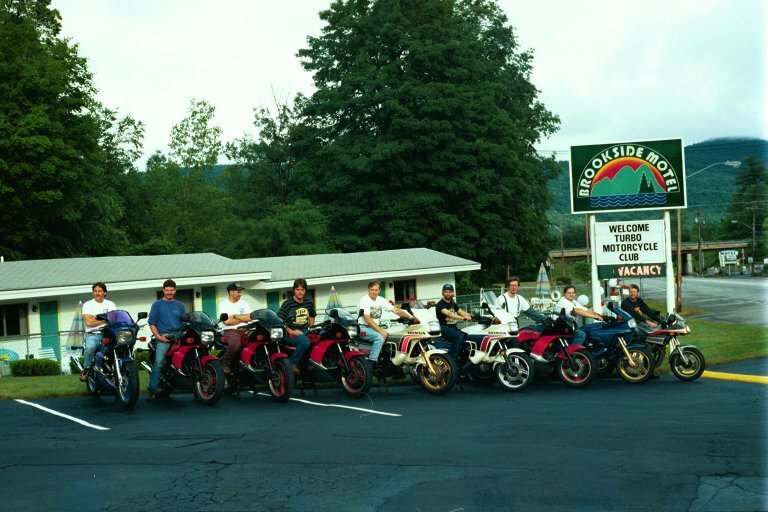 There were nine Turbos (five GPz750T's, two CX500's, one CX650 and one XN85) and two missing in action (one GPz750T and one XN85) made it to Lake George Village. About 30 were expected. Can't blame them for their change in plans. You know your Rally is a disappointment when the best riding you encounter is on the trip back home. That was the case for Rick Coder and I on our return to NJ. We turboed under clear skies Monday morning down Route 87 for about 80 miles, running briefly into the triple-D's (just to blow all that moisture out of our engines, honestly officer). Then it was onto Rt. 9W the rest of the way (130 miles) to Englewood. 9W has a few stretches of twisty, scenic road, the best being the 5 miles or so that winds its way uphill and down again to West Point. Of course it was raining again, which put the kibosh on some REAL fun, but by now the ride had taken on an almost surreal, mystical quality, as we rode through the clouds and gazed over to where the beautiful Hudson River should be (we couldn't see it of course). But hey, we could almost see it, which was good enough for this trip that was jinxed from the get-go. By some definitions any motorcycle trip is a good trip if you arrive home safely, so in the confines of those narrow parameters this was a good trip. The only mechanical difficulty we had were some stripped threads on the extender elbow on Rick's XN85 left side mirror assembly. We just chucked the piece and screwed the mirror directly into the mount. Nearly the same visibility as with the elbow but a lot cleaner looking. Finally, an effective mod for XN85 owners! Thanks to Rick Coder (and his patient wife and daughter) for flying in from Texas and joining us for the Rally... Special thanks to Mike Chestnut for coming all the way from sunny California, riding a thousand or so rain-soaked miles from Kentucky to Pennsylvania, and still having the fortitude to travel another 400 miles to Lake George... Congratulations Paul Brown, on your seventh Turbo Rally... We all missed, among others, our Leader of the Pack, Allen Lough. And thanks to all the Rally participants for helping make the best of a tough situation. All I can say is see you in Asheville, North Carolina in 1999!